"Oftentimes when I (Angela) hear the phrase "in the trenches" I think of the members of our armed forces, fighting in intense battle. Though recently, I'm learning to see that phrase in a whole new light. One of the main roles in my position at the ranch is a session leader. During 90 minute session times with my assigned kiddo, I've had the opportunity to walk through the trenches with kiddos "fighting" enemies in different forms. During our first week of sessions last season, I was excited to learn that I would be paired once again with Leighann, a sweet girl that I got to spend time with during the previous season. After saying our hello's and getting caught up with each other after our time apart, Lei Lei expressed her desire to ride a big horse this year after having ridden a miniature horse the summer prior. Knowing that this wish could be granted, we set out on our mission for the day, to ride a big horse. An Appaloosa named "Boy", became Lei Lei's horse of the season. After grooming and tacking him up, it was time to ride. Teaming up with two of my coworkers, our little group headed into the round-pen. 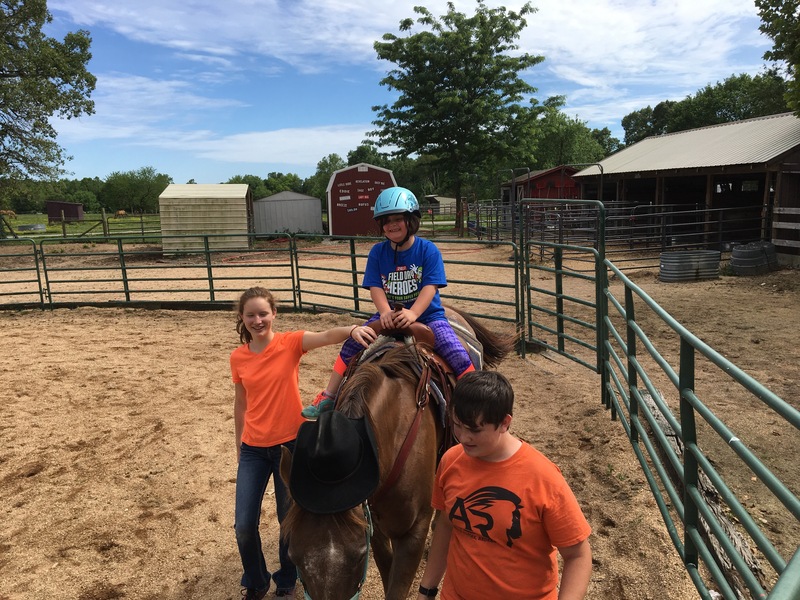 As I watched my kiddos face as she climbed the stairs to mount, and started to pull herself up into the saddle, I could tell something wasn't right. Whispering so only she could hear me, I asked, "Are you okay? Nervous?" With a quick nod of her head she put her foot back down onto the mounting block, and stood waiting. It was then that I felt the Holy Spirit's prompting. Knowing that I didn't have much time to waste, as I could see the giant of fear quickly approaching to make its attack, I asked her, "Do you want to pray first?" Joined by my two teammates, we prayed together for courage and for the nerves and fear to subside. After our prayer, I glanced at Lei Lei, and asked, "You ready"? With a look of determination on her face, she nodded her head in agreement. Praying silently against the giant of fear on behalf of my session kiddo, I watched as she put her foot in the stirrup. With a little boost, Lei Lei swung her leg over the saddle and mounted, kicking that ugly giant square in the gut! Many cheers, shouts of joy, and clapping followed as Lei Lei sat tall in the saddle looking slightly hesitant and excited all at the same time. After a few laps around the round pen, Leighann was laughing, and had a huge smile on her face! 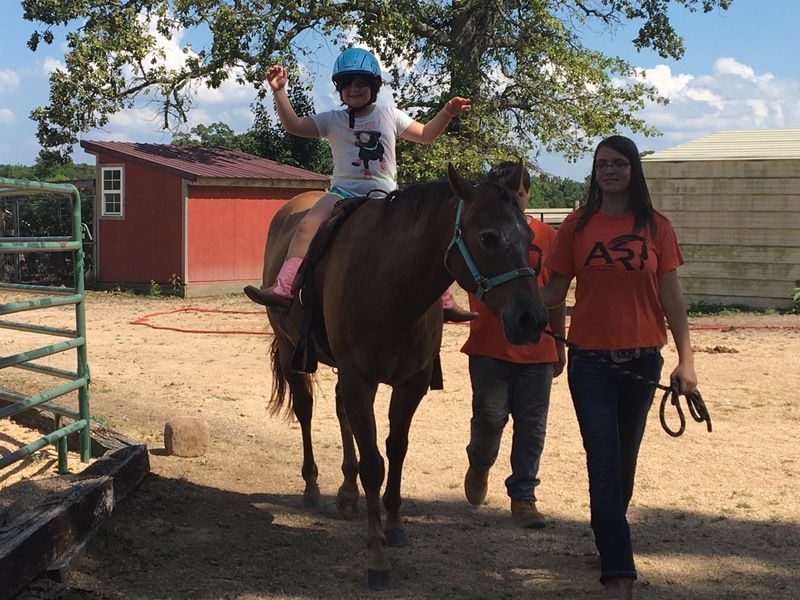 By the end of summer, Lei Lei had turned into a great little rider, and mounted Boy with no fear! Sometimes God calls us into the trenches to support each other during difficult times in our lives. These battles aren't always against enemies that are visible. Some are the invisible. Fear, sadness, rejection, anger, loneliness, and other enemies can and will strike at one time or another. Are you willing to fight alongside someone you know as they pick up their weapons to fight? Maybe your only required action will be to pray with them in that moment. Friend, no matter how God calls you to action today, if you follow His prompting, the outcome will always be worth it."